The Jacksonville Jaguars fired their offensive coordinator Nathaniel Hackett earlier this week, promoting quarterbacks coach Scott Milanovich to Interim offensive coordinator in his place. This is a somewhat familiar trend for the Jaguars; now-former Coach Hackett started as the team’s quarterbacks coach in 2015 before being named interim offensive coordinator following the firing of Greg Olson during the 2016 season. With the cycle of interim coordinators repeating in Jacksonville, we thought this a good time to examine the recent history of interim coordinators in the NFL. 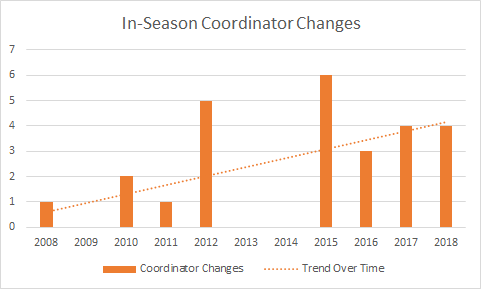 We find that the frequency of such in-season coordinator changes is increasing over time. This trend is especially true for offensive coordinators. This investigation becomes more striking when we break these overall numbers down into offensive and defensive categories. Here we see a marked difference in how the league treats its defensive and offensive coordinators. 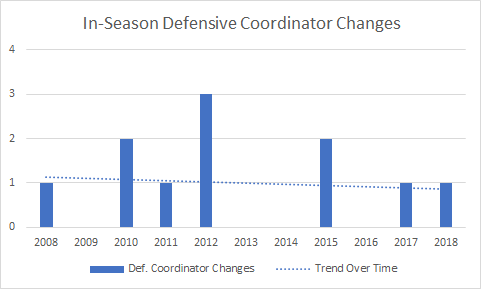 There is a somewhat steady trend on defense, with roughly one coordinator change per season. Offensive coordinators, on the other hand, are suddenly much more replaceable in-season. 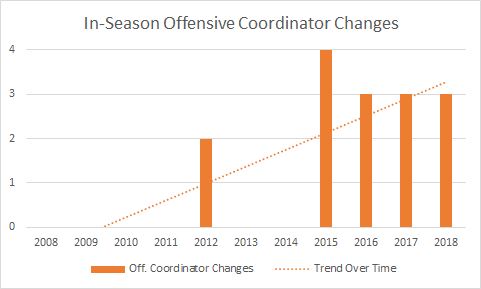 Since the 2015 season, there have been 13 midseason offensive coordinator changes, half of all midseason coordinator changes since 2008. The increasing instability of the offensive coordinator position comes at a time when the NFL sees an increased emphasis on offense overall. Offensive numbers, especially through the air, have been notably inflated over the past several years, leading multiple teams to attempt to find the latest and greatest young offensive mind at the coaching level. This offensive explosion appears to make teams more impatient with their current offensive infrastructure. Such is the case in Jacksonville this week, where Nathaniel Hackett’s replacement occurred concurrently with the benching of embattled starting quarterback Blake Bortles. In our next article examining in-season coordinator changes, we’ll look at the outcomes of such moves, and examine whether or not such an in-season replacement yields increased performance. *Coordinator changes include both coordinator firings and when head coaches relent their play-calling duties.